This entry was posted on Saturday, September 3rd, 2011 at 22:46 and is filed under Doctor Who, podcast, review, Sci-Fi, staggering stories, Staggering Stories Podcast, Staggering Stories Regular Podcast, Torchwood, tv. You can follow any responses to this entry through the RSS 2.0 feed. You can leave a response, or trackback from your own site. 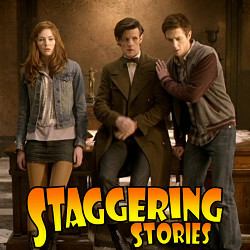 2 Responses to "Staggering Stories Podcast #114: Monster in the Cupboard"
Enjoyed your discussion, gang, but I will come to the defense of the “daft title,” “Let’s Kill Hitler”: don’t forget that the “tiny cross people” inside the Teselecta identify River Song as “history’s greatest war criminal.” Granted, their mission is not to kill history’s villains — just to “give ’em hell” — but it could be that River Song is “their Hitler,” as it were. And we know that the Silence regards the Doctor as an enemy to be killed at all costs, hence their training of River as a super-assassin — so, they have their own “Hitler” they’d like to kill, too. “Hitler” as shorthand for The Biggest Baddest Baddie you can imagine? Makes the title work on several levels.